Today I'm hosting a human resources practitioner with whom I share several passions. He has had his share of international travels and a taste of various cuisines around the world, but for comfort food he goes back to his hometown, and the cooking of two women closest to his heart. Simple, yet hearty and delicious! That's what adobo is... A veritable heritage that lives and continues to evolve as Pinoys at home and in diaspora take their place under the sun. If there's a Filipino soul food, adobo would be a definite shoo-in. Below is my personal vignettes and memories that adobo evokes. Yes, adobo is intertwined with my feel good, childhood memories of ordinary events, significant persons, and the sights, sounds and wonders of yesteryears in a rustic little town called Kalayaan in Laguna. Exhausted from wild games or exploring the orchard at the back of Lolo Tomas and Lola Poten’s house, my brothers, sisters, cousins and I would run back home at dusk. It was always a beautiful time of the day when the heat would become more bearable and the skies would turn to gold, then orange, and finally into different hues of a soft rosy glow as the sun sets, auguring a cool breezy evening. We would hear our Lola Poten’s call for us to prepare for Oracion from her kitchen as from a distance the church bells tolled. Racing to go to the baño to wash up and prepare for the prayer, our hunger pangs would be stirred by the appetizing aroma of pork adobo simmering in the flavorful mixture of coconut vinegar, toyo (soy sauce), crushed garlic and freshly ground black pepper over my Lola’s homemade stove of ash as the last of the firewood smolders. The Ave Marias would be accompanied by awakened little gourmands’ desires, with thoughts flying to the delightful treat awaiting. The mano po (kissing the hands of the elders) at the end of the prayer would be hurried! We would again race to the dining table at the kitchen and sit side by side in two long wooden bangko (benches usually 2 meters long sans backrest) on either side. Eagerly, we would await generous servings of sinangag, rice sautéed in garlic and the remaining adobo sauce in the same pan where adobo was cooked, and, of course, our share of pork adobo. A hearty evening meal, it would always turn out to be that we took time digesting as we retired to the sala seated on the floor at Lola’s feet listening to her own retelling of folklores about kapre (a tobacco-smoking giant), tikbalang (a creature with the head of a horse and the body of a man), aswang (a being that has powers to transform into any animal and preys on unborn children), mangkukulam (witch), duwende (dwarf), diwata (fairy), and other denizens of the Filipino mythic world. In time, my Mang (as I call my mother, as Pang is to my father) mastered her own pork adobo recipe, duplicating Lola’s feat with us. It became a treat when we had it for meals at home or when we had binalot (traditional Filipino way of packing rice and any dish one fancies in banana leaf, ran over the flame to make it pliant and sturdy) with pork adobo in our lunch packs when we went to school. Pork adobo is pork adobo when there is just the right degree of sourness from coconut vinegar, balanced by the flavor and saltiness of soy sauce, and spiced up by garlic and black pepper. 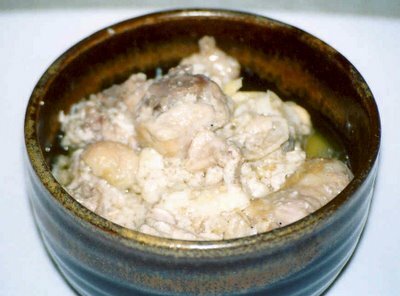 The meat cut into cubes is first boiled in water to desired tenderness. The admixture of vinegar, soy sauce, garlic and black pepper is added and the concoction simmered until almost dry and oily. Traditionally, however, or so my Pang and Mang told me, it was cooked in huge quantities, as a way to preserve food way back when refrigerator was yet to be invented. Adobo was a regular dish on the table heated repeatedly each day. The sauce eventually thickens, meat flakes, the flavor and aroma becomes stronger for a sinfully delicious cholesterol-laden dish! Oh well, in these days of heightened health awareness… indulging from time to time is a temptation I really can’t resist. Some people like it sweet by adding sugar to taste. Some like the added woody, but pleasant, and slightly minty aroma and flavor of laurel (bay leaf). But I like it cooked simply my Lola's and my Mang’s way. Thankfully, though Lola and Mang have since taken the journey to the next life, my Ate Weny and, later on, my nephew Mark, were able to continue dishing out the family recipe that’s always a hit even with guests and friends who happen to pass by during lunch or supper. With the exception of luto ni Lola, I couldn’t eat anything that Mang did not prepare when I was a young boy. I was picky and hard to please come meal times. A dedicated teacher, Mang was busy even at home preparing her lesson plans, checking her pupils’ papers, and studying for her masteral degree. My siblings and I (all six of us) were left in the care and the cooking prowess, or the lack of it, of our yaya five days a week. Hence, weekends became special days. Aside from being a respite from school, these days afforded Mang time to cook for us. Among my favorites was her Adobong Manok sa Gata, a chicken dish in coconut milk and vinegar, spiced with minced onion and, as usual, crushed garlic and freshly ground black pepper. Even just the aroma of it cooking in Mang’s kitchen perked up my senses, and worked up my appetite to the surprise and delight of Mang, Pang and our yaya. Adventurous and daring in her kitchen, Mang was wont to prepare something new or something usual but with a twist for us. 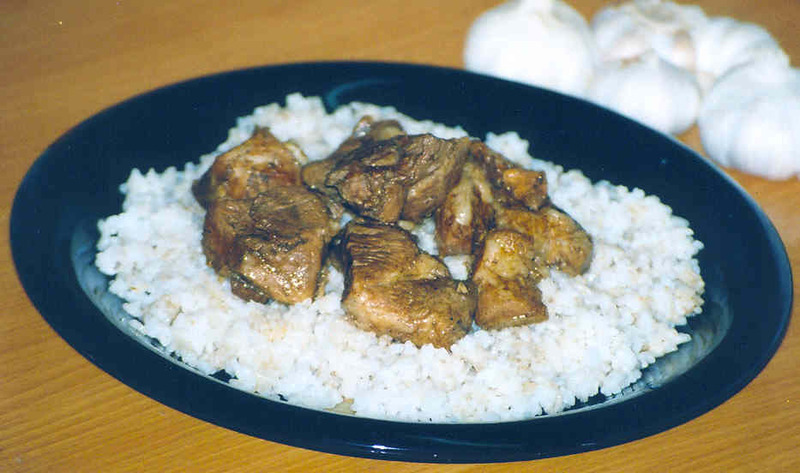 Thus, the same adobo recipe was prepared many times over using carabeef (carabao’s meat). Introduced to the dish on the pretext that it was just an ordinary beef dish, my brothers and I dug in and ate with gusto. My sisters, who were wary of the darker shade of the meat, initially picked on their food but soon found their way to finishing their plates. From then on, it became another family favorite. Adobo sa Gata! I don't get to have it often, but I do love it...It was also one of my my late grandfather's favorite dishes! Whenever we hanker for something comforting adobo with hot steamed rice is our answer. I agree, adobo is Filipino soul food. And we have a hundred and one (or more!) ways of cooking it. It can never be boring. Thanks for joining Lasang Pinoy Serge! We hope to see more of your posts in the future. I love adobo too! I'll have to try the one with gata next time I make it :-) I was going to post adobo for LP4 also, but we always eat it up before I could take a photo. I love adobo, too, and I keep finding many, many ways to do it. I found an adobo cookbook at Fully Booked, and it lists 250 adobo recipes. WHOA! adobo sa gata..next time i'll do that..also when you add bagoong and lots of sili to your adobo..it's called bicol express, right? Yup, Ces, but in Bicol Express small pork cuts are used. But maybe chicken will work well, I've cooked binagoongan with chicken with excellent results. ayayay! adobo would be forever in my list of favourites!